LA ROMANA, Dominican Republic (Jan. 18, 2019) – Twenty feet away, Juan Cayro Delgado was not visible through the media scrum. When you’re the home-country favorite, everyone wants to hear from you. Delgado kind of likes that. “I’m just trying to look at it as just helping me more. People are supporting me, and in a way that makes me feel better when I’m playing,” he said of the circumstances around his Latin America Amateur debut. Opening rounds of 69-68 at Casa de Campo’s Teeth of the Dog course put Delgado, at 7 under, on top of the leaderboard after Friday’s morning wave. His parents, watching intently as Delgado fielded post-round questions, were just hoping he would make the weekend. This is his first time playing the LAAC, but he has played Teeth of the Dog dozens of times, starting at the age of 10. For the eight Dominican Republic players in the field, course knowledge is no issue. Teammate Enrique Valverde estimates he played it 75 times over the past year – just here and there with teammates until he got comfortable. Roughly 20 minutes after Delgado signed for his 68, Valverde came in with a 1-under 71 that left him 3 under and among the top five players on the leaderboard. Delgado and Valverde were ranked Nos. 1,455 and 2,574 in the World Amateur Golf Ranking, respectively, at the beginning of this week. Familiarity and patience go a long way – and being under the radar. Both acknowledged that they weren’t among the favorites entering the week. In Delgado’s case, he knows how to win here. It’s where he claimed the National Youth Championship title in the summer of 2017. The wind hasn’t even come up yet this week, but when and if it does, assume that the home course advantage is that much more important. Seven holes are on the edge of the Atlantic. “I just like the golf course, we haven’t had that much wind out here these first days, but I like this course because I like playing in the wind,” said Delgado, who is headed to the University of Central Florida next fall. Valverde, who has played this event twice before but never made the 36-hole cut, stressed the importance of staying focused. 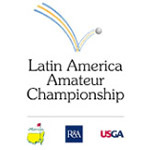 Neither Delgado, 17, nor Valverde, 19, were in the field in 2016 when the LAAC was last played at Casa de Campo. But both players, from nearby Santo Domingo, were on property. Delgado’s father, Juan Cayro Senior, remembers bringing his son. “When he came here, he said that he wanted to be there someday,” the older Delgado said. Casa de Campo is the only course – and the Dominican Republic the only country – to have repeated hosting duties since the LAAC debuted in 2015. Drawing new players into the game is a cycle, and Valverde this week is thinking about the younger boys back home in Santo Domingo. It’s his turn to set an example. 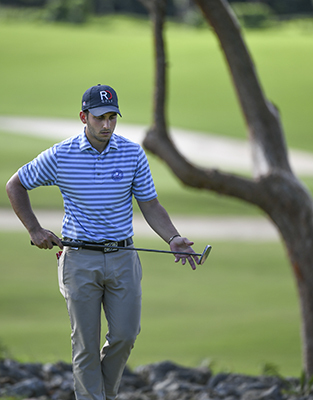 Influenced by his father, Valverde started playing golf when he was 9 years old. Back then, he knew of only one Dominican Republic player on a U.S. college roster. That was Santo Domingo’s Willy Pumarol, a current PGA Tour Latinoamerica player and a Barry University alum. More than half of this year’s Dominican Republic contingent plays college golf, including Valverde, who is a sophomore at Wilmington (Del.) University.